Can high expenses actually save you money ? What is the utility value of your expenses ? How do you quantify what you get for your spending ? Sometimes expenses are just that – spending on services that don’t typically have any major long term expectation of any financial return – for example: dinner out, netflix subscription, dry cleaning bill (etc). Sometimes though spending can get you into opportunities you wouldn’t otherwise have had. For example, spending $5 on lattes everyday according to some is taking from your financial future with small daily luxuries that add up over time – leading you to ultimately miss out on huge amounts of compound interest on your investments. However maybe the down time away from daily life while you get your coffee, gives you enough thinking space to come up with your next great business idea. Arguably people can think without coffee (at least I’ve heard rumours of such people) – but maybe that’s what you personally need to be that organised in your thinking. So maybe that annual investment was 100 x $5 lattes = $500, but you thought about an eBook which ultimately generated $500 in sales – so that would be arguably break even on your coffee investment (apart from your time). A more extreme example might be renting walking distance from work in an expensive city versus commuting. How can you justify spending thousands extra per year just for a lifestyle choice ? That is crazy money for a lot of people, but that is relatively easy to burn through in a high expense metro area, just renting a decent apartment in a nice neighborhood with the family and a couple of kids. For example rent can be conservatively $50k a year for a 2 bed apt in Manhattan. Rent outside the city would be say $30k a year, so you can save $20k a year on rent by commuting. But then you have pay for (maybe) a car to drive to the station, then battle the train and all those other people that seem to inhabit cities. So bottom line maybe you end up saving $15k, but you are spending say an extra 2 hours a day travelling, which is 10 hours a week or 12.5 work weeks per year commuting. For some people, commuting could increase your stress levels significantly, but it might not. Some people I know are very productive on their 7am commute, and clear all their inbox before they get in the office at 8am, and then leave early at 4pm to be back home for 5pm with the family. But that requires flexible employer working arrangements and personal discipline – i.e. no happy hour in the city after work. If you work close to home, there are intangible benefits like being able to go home at lunch to quickly get some task done. Being able to use the time productively. You can walk everywhere, so arguably don’t need a gym membership. You have the mental and emotional energy to do the things that must be done at work. If you are in a job that has a significant annual bonus tied to performance, your competitive edge can be living and working close to work – you quantify the success of the strategy at the end of the year. Using the above example, if your after tax bonus makes more than the $15k savings difference, then you could consider your “excessive” rental spending for that year to be a win. If you are not in a job situation that has a bonus, then arguably it is just a lifestyle choice, maybe not a good financial choice – but that might be justifiable for your personal approach to life, but at least understand your trade offs. Arguably in this situation you have “spent money to make money”, lowered your stress and improved your quality of life. There can also be a short term monetary value on reducing general life stress (like commuting) because it frees up your time and your mind to actually think about other opportunities. However also there can be long term benefits in terms of reduced future health care costs due to stress related issues, but that is obviously harder to quantify. In an earlier post we worked out your actual after tax savings rate, and decided this is way more important than just your salary or your actual expenses. It figures out “how much do you keep?” not the usual question of “how much do you make?”, so it is a much better measure of financial improvement. Importantly this number easily allows comparison between different peoples financial situation. your after tax hourly pay MINUS your actual living expenses DIVIDED by your hours worked per week. 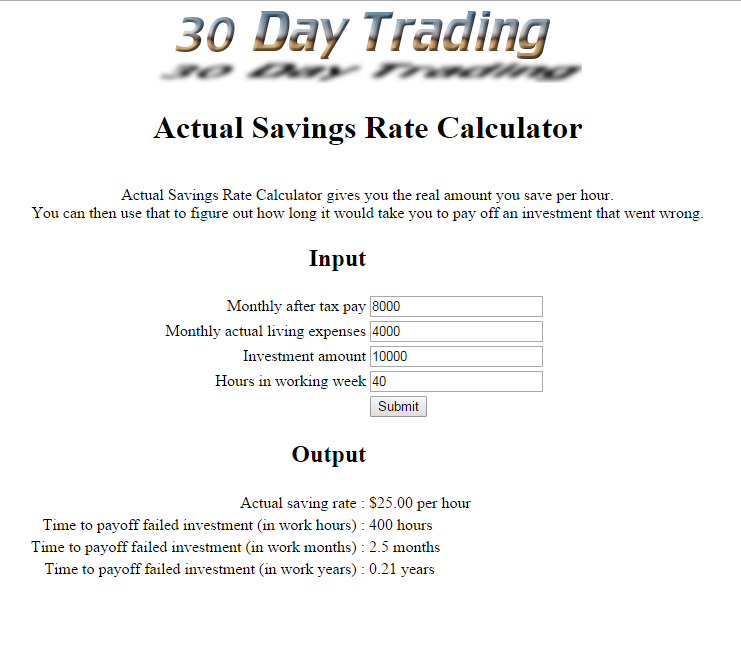 If you haven’t previously, you can quickly work is out here using this calculator. Individual salary and expenses alone doesn’t tell you much, but how much your Actual Savings Rate towards your personal target is much more important. A person that saves half of their earned money (after expenses) can have a better shot at early retirement, than someone who makes twice as much but only saves 10%. It’s a good sound bite to say “oh they make tons of money”, or that couple “spends way too much”, but its usually too simplistic figure out to figure out if they are financially “successful”. Lets look at some different couples, where both people work and they have varying different income and expenses. But first some definitions so we can compare the couples together. Couples – considered to be two people in a household, where either both or one person works. Click each link in the table below to see their projected early retirement date. Income – Annual after tax pay on the first line. The person 1 and person 2 pay split is on the 2nd line in brackets, with the highest earner first. The following tables gives some example numbers for well paid professional couples working in a large US metro area in 2016, but absolute numbers are not as important as the ideas behind each couple. The numbers can be adjusted up or down as appropriate for your situation. Couple 1 has high expenses, so most people would say they have a higher leveraged lifestyle. However if either person in couple 1 lost their job, they could still survive without cutting into savings. Couple 2 makes the most money, but have high expenses and one point of failure being totally dependent on one salary – however they would stereo typically be seen as the “most successful” couple by many people. Couple 3 have the lowest expenses, so they would probably be seen as the most financially prudent because their expenses are lower, but still have some employment risk because if either couple lost their job they’d have to use savings to live on. So the way the income earned is split between the partners in a couple can also reduce risk, as well as just salary and expenses. In a couple, if either persons salary can cover total expenses, then there is a less risk that just relying on one salary. If one partner earns significantly more than the other, running side projects for income could be use to make up difference between the 2 salaries. High expenses don’t necessarily mean that someone is saving inefficiently. Also the way income split is earned between couples can become a risk as well. Many financial blogs simply argue that if you have high expenses you are divorced from reality and the only solution is to reduce expenses. However for example high annual expenses could just the cost to able to live comfortably in an expensive city, that allows you to get a reduced stress opportunity at making the big bucks. High expenses can potentially disappear after leaving the city either for a career change or retirement. Assuming the expenses are not addictive “must have” lifestyle choices, they could easily be reduced long term – its not all going on day spas and massages (!) often just on basics like rent or daycare. The point is not lecture on “this is right, this is wrong” approaches, but to actively understand why you are making active spending choices and if you can optimise them to improve what you keep in your take home pay. Using your actual savings rate can be a good way to determine what size an investment should be, if you are not sure “how much” is too much. Basically if this investment went to zero, how much time would I have to work to earn it back ? Monthly after tax pay – means the amount you get in your checking account every month after tax and everything else has been deducted. This will typically be pay that has had the following removed: federal tax, state tax, 401k contributions, health care premiums and commuter benefits. Furthermore we will assume that retirement savings like 401k contributions are not included in the calculations, because we are trying to deal with our after tax pay rate. Obviously 401k contributions are “savings” but the idea is to try to come up with calculations that work with month to month after tax pay, effectively your real working monthly budget of “money coming in”. Lets assume this is $8000 a month. Monthly actual living expenses – means everything in your budget you need to live in an average month – including housing, food, entertainment, travel (etc) – basically everything. The monthly amount will move around in some months (for example if you pay for a holiday) but a decent start is to calculate use last year’s total living expenses (divided by 12). Lets assume this is $4000 a month. Actual saving rate – this is all of your after tax income minus your monthly expenses. Therefore using the above examples that would be $8000 (income) – $4000 (expenses) = $4000. Assuming a 40 hour work week, this means your actual savings are $1000 a week, $200 a day or $25 per hour. Time to payoff If you lost the entire investment, how long would it take you work to “pay off” the loss? For example, if you invested and lost $10,000 it would take you approximately 10 weeks of 40 hours (or 2 and a half months work to pay it off). Consider another more extreme example. If you have been fortunate enough to accumulate a $1 million portfolio, we could use a very simplistic “worse case scenario” giving a 50% haircut to $500,000. Using the $25 per hour work rate (from above) it would take you approximately 20,000 work hours or 9.6 years to pay that off. Just think about that in relation to your existing stash, particularly if has been allocated into one strategy like a Modern Portfolio Theory asset allocated portfolio. Very few standard financial risk assessments look at the individual work time required for this “replacement risk” of earning back lost money. They typically include only a before tax salary number and a percentage saved of that salary – which as we’ve discussed previously it is not that useful a number. Understanding your risk along the way at all points in your portfolio life time, from starting working to almost finishing. Don’t simply buy the usual argument that risk in the early years “doesn’t matter” because you have time to make it all back. Now you can actually answer the question, how long is it going to take to earn all this back if it goes wrong ? You may now look at risk in a different way. The American dream is supposed to be if you work hard, make a few sacrifices, then you’ll ultimately be a millionaire or financially comfortable at least. But why do some people feel like they can’t get ahead ? Historically in our parents generation there was more job security and results were more linear – e.g. work for 30 years, save a similar amount each year, bit in the bank, bit in stocks (biggest bull market in history) and away you go into the sunset. The standard middle class track has arguably been suffering since year 2000, and there is this overriding sense that somehow the average person is getting short changed or it’s harder for them to get ahead. In that period there has been market volatility, with the dot com crash (2000), the largest recession in living memory (2009), then one of the longer bull markets in history (6 years from 2009 to 2015(?)). People have felt more financial volatility in the last decade than their parents were used to, although historically this type of greater market volatility is more “normal” market behaviour. People have several ways to live life financially, and these are often based on modelled behaviour typically from their parents or mentors along the way. Purple line = many people’s perception of the american dream, that they think their financial progress should be relatively steady and linear. Potentially was their experience from watching people in their parents generation, “slow and steady wins the race”. Yellow line = new reality of working and getting ahead, harder and harder with less rewards for more effort. Not sure why cant keep up with standard of living. Green line = either an excellently paid professional OR an entrepreneur type starting a new business. Potentially (significantly) lower rewards in the early years, but hopefully with the curve increasing where the business starts operating under its own steam, eventually leading to “escape velocity” where the rewards for the effort are outstanding and non-linear and important owner self sustaining. The business owner doesnt not now have to invest as much time or money to run business, hence increased freedom as well as money. Curve can be much steeper if success comes faster. So why this negative perception on “getting ahead” today ? People perceive that they have to work harder and for less relative pay, which helps explain why today people think it is hard to get ahead, even if they have a very good job. - Declining wage growth when compared to inflation, sometimes due to outsourcing, but sometimes due to processes getting more efficient or just being automated more effectively. - Less job security, careers can change or disappear with economic conditions, and less likely that people will do the same job for life. We’d argue that today for the career categories from “poor” up to “very good”, on average people are receiving the rewards one level below what their parents generation got. However the big change is in the excellent category where the rewards are potentially expodentially better than their parents generation. However to these outstanding rewards require thinking outside of the standard career process. Arguably this is why people think they are suffering on their chosen career path IF they are looking for it to provide them with financial freedom; they are trying to make the current standard career with a company do what it cant do, make you wealthy. That said, if you have an excellent job or start a business you can do potentially do very well, and become wealthy in a non linear way. Indeed for certain people like sports stars, CEOs and successful business startup owners, the rewards have never been greater. But they are for fewer and fewer people, because they typically require a level of excellence or hard work (and maybe luck) to achieve them. That is not to judge or call for wealth distribution, just recognise that you are not playing a linear game. Therefore on the lower rungs of the career ladder with a standard approach its hard to get ahead and seems “not fair”. How about doing both the day job and be an entrepreneur ? Sometimes people split these career approaches into labels like “middle class” (standard track) or “runs own business” (entrepreneur track), but you are allowed to do pick and choose aspects from either approch that work for you – just try and fit it what you can around your current job. For example, although we don’t like to admit it, many people’s personalities (including mine) can not deal with the constant (initial) failure associated with entrepreneur and keeping motivated when things go badly. If you know you don’t handle that well, the hybrid track standard/entrepreneur might be a good approach for some. Basically keep the day job as an income stream, but recognise that it will not make you rich on its own, but it is necessary to keep the lights on with a minimum of stress. Then take on side projects with ideas you care about. This can be good hybrid of the stability of the standard track, with the upside potential of the entrepreneur track. Plus you will always learn lots of stuff if you try to start your own venture or business. In many ways there has never been more opportunity to take this “hybrid” track to learn or start a business part time. There is a massive amount of knowledge available online and even properly organised education classes (e.g. Khan academy). The tools are amazing and you can learn so much stuff for FREE just by researching without ever leaving the house! If you dedicated 5 hours a week to studying anything instead of watching Netflix that would be about 250 hours a year (or 6 weeks of study). The key that you have to want it, you have to want to do, be motivated, which includes working when you don’t want to. That’s not to say don’t make it just a task, but you have to overcome the initial urge to do not want to do it. It is useful not to push yourself beyond your breaking point of interest, because then sometimes you don’t come back to the work for several days, and you lose momentum. 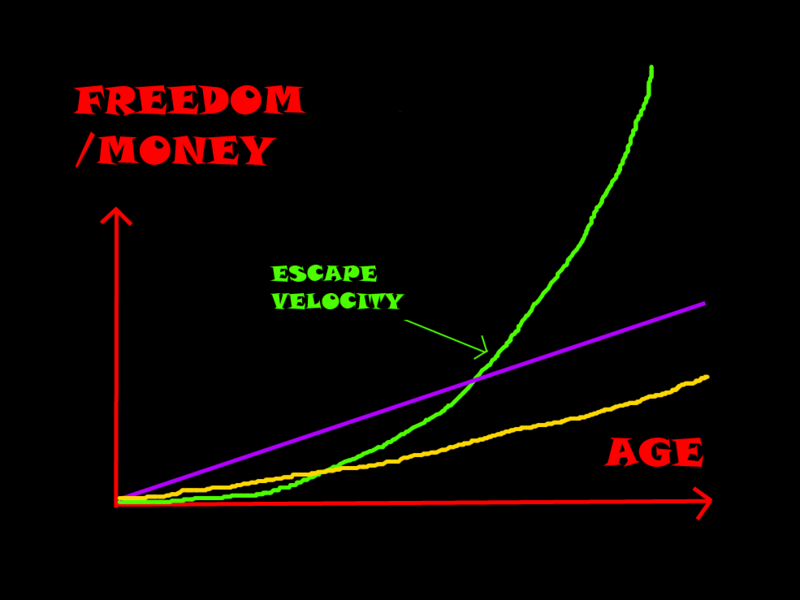 Basically recognise that a career and financial freedom is not linear. Also its ok to try the entrepreneur approach at the same time as the day job. If you are not interested in that then its fine to carry on – just don’t expect something from your career today that it might not be able to provide in the long run. If you are interested in trying new stuff, good luck to you and even if it does not work out you will learn a ton of stuff about yourself and how to run a business. Individual bonds versus bond funds. This blog post will look at why investing in bond funds can be more “risky” than an individual bond portfolio.